No images of Ursula von Münsterberg are known to exist. 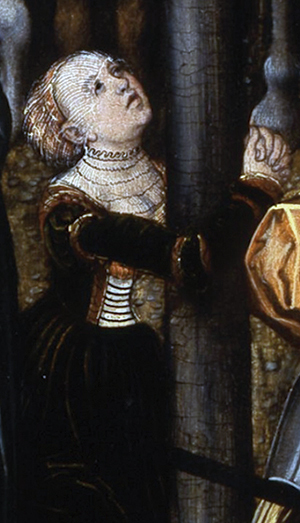 This painting, by Lucas Cranach the Elder, represents Mary Magdalene. Ursula was a member of a monastic community called the Order of Mary Magdalene the Penitent. It was early October, the year of our Lord 1528. The evening was fine, but the light breeze carried with it a hint of the frost to come. The rising quarter moon cast a silver sheen over the stone walls of the old convent. In the distance, an owl hooted. Nothing stirred within the convent walls, save perhaps the quietly whispered prayers of someone observing a lonely midnight vigil. Three women let themselves quietly out of a side door. Their long heavy cloaks and hoods disguised them, but as they moved an observer might have been able to catch a glimpse of nuns’ clothing brushing the cobbles. They carried small packs of provisions. Just before they disappeared into the shadows of the trees, the leader of the trio looked back at the quiet walls for the last time. This convent had been the only home she had known since childhood. Was she excited? Terrified? Was she grieved that her commitment to Christ necessitated a flight by night? Many would guess this committed Reformer to be Katie von Bora, former nun and future wife of Martin Luther. In actual fact the leader of this small group was the Lady Ursula von Münsterberg, grand-daughter of the King of Bohemia. She had lived at the Convent of Mary Magdelene the Penitent in Freiberg since the death of her parents when she was a very young girl. And on October 6, 1528, at the age of 38, she fled that life forever. The seeds of the Reformation had been planted some years previously, when a few Lutheran books had been smuggled into the convent. Later, two Lutheran chaplains were assigned to the sisters, apparently at the request of Ursula and with the help of her cousin Heinrich, who had embraced Luther’s theology himself. The letter went on to become an influential tract. Martin Luther himself provided an afterword commending Ursula’s work. The tract was widely circulated to help further the message of the Reformation, especially to nuns who were uncertain of their salvation. As for Ursula herself, she and the two young nuns who accompanied her sought refuge with the Luther family in Wittenberg for a time. Her later life remains largely unknown, and it’s believed she died only six years later. The date and place of her death are unknown, and unmarked. There are no paintings of her. Most people have never heard of her. She died in obscurity, poor, and estranged from much of her high-born family. Ursula von Münsterberg reminds us that the message of the Gospel applies to every one of us, whether man or woman, young or old, wealthy or poor. She also reminds us of the important role women have always played in bringing truth to light—at the time of Christ, during the Reformation, and in our own day, by proclaiming the Good News of Christ. May the faithful witness of Ursula encourage us in our daily ministry as well, even if it should cost us our earthly all.